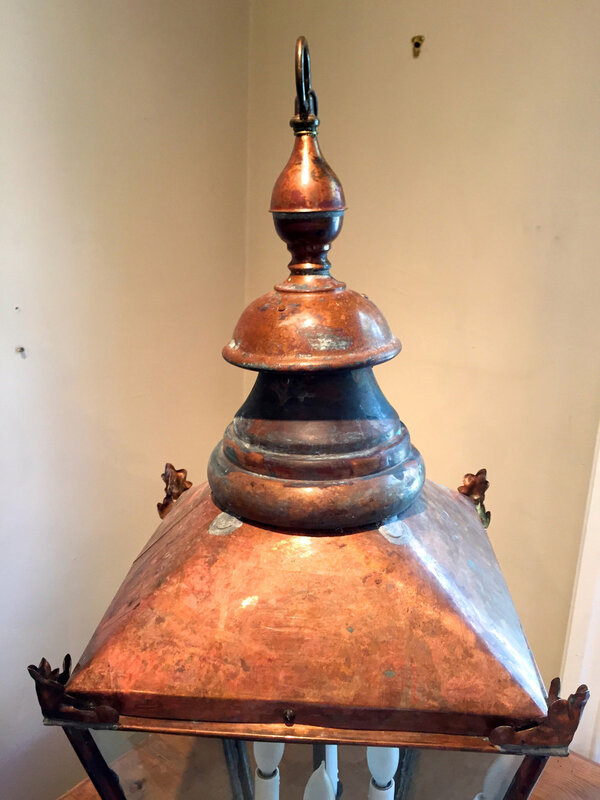 This classic English copper street lantern features a tiered finial decoration at the top, simple repoussé "ears" on all four corners, and lovely small ball feet on the bottom corners. We have electrified it for the U.S. and added a custom-made antiqued brass cluster of 4 small "candlelight" sockets, each of which accepts up to a 75 watt bulb, as well as a matching brass hanging ring. The light copper patina produces a beautiful effect and the lantern is sold with 6 feet of wire, chain, and a matching canopy, all in a matte espresso brown/black finish. Of course, we can lengthen or shorten the chain and wire if you desire.